This article on the pick and roll offense has been excerpted (with permission) from Dr. Hal Wissel's book, "Basketball: Steps to Success", the new third edition. 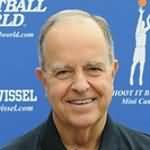 In Basketball: Steps to Success, Coach Hal Wissel covers the entire progression from fundamentals to team play needed to become a complete player. With 12 steps total, this third edition provides a lot of new information for the player. Step 4, Shooting, now includes information on shooting runners, reverse layups, and power moves, with additional drills. Three entirely new steps have also been added: step 5, Shooting off the Catch; step 6, Creating Your Shot off the Dribble and step 7, Scoring in the Post. In today's game, using dribble penetration to draw defenders and then passing the ball out to players for open three-point shots has become a trend. The pick-and-roll is the leading method for gaining dribble penetration and then drawing and kicking to open shooters. Due to this trend, the new edition includes extensive coverage on executing the pick and roll in Step 10, Two and Three Man Plays, and Step 11, Team Offense. Methods for defending the pick and roll are covered in Step 12, Team Defense. Greater emphasis is being placed on the open or spread offense, dribble penetration, and the ability to draw and kick to three-point shooters. The pick-and-roll (also called the ball screen) is one of the oldest plays in basketball, but it is now being used more than ever. At the professional level, the pick-and-roll has become a primary part of the offense for most teams. It has also become a part of college and high school play. 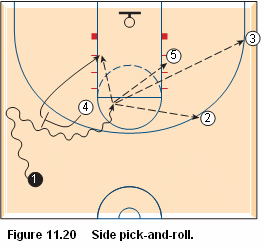 Pick-and-roll is a broad term for many actions. In the pick-and-roll, the picker sets the pick and then rolls (cuts to the basket) for a possible inside shot off a pass from the ball handler. If the picker is a good shooter, a pick-and-pop may be used; this play has the picker popping out for an outside shot rather than rolling to the basket. Pick-and-roll plays may be a part of a set offensive attack or a part of an early offense at the end of a fast break. Several types of pick-and-roll plays may be used, and they can take place in various spots on the court, including the top, side, elbow, and corner. 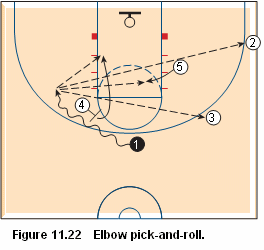 The following are some common pick-and-roll plays (figures 11.18 to 11.23). Figure 11.18. High pick-and-roll. Player 5 sets a pick at the top for player 1. Player 1 dribbles off the pick, forcing player 5's defender to give help. Player 1 takes at least two dribbles past the pick to create space. Player 1 can then shoot a jump shot, pass to player 5 rolling to the basket, pass to player 4 cutting up to the weakside elbow, pass to player 2 in the strongside corner, or pass to player 3 in the weak-side corner. Figure 11.19. High pick-and-pop. Player 4 sets a pick at the top for player 1. Player 1 dribbles off the pick, forcing player 4's defender to give help. Player 1 takes at least two dribbles past the pick to create space. Player 1 can then shoot a jump shot, pass to player 4 popping to the weak-side elbow area, pass to player 5 cutting to the strong-side low post, pass to player 2 in the strong-side corner, or pass to player 3 in the weak-side corner. Figure 11.20. Side pick-and-roll. Player 4 sets a pick at the wing for player 1. Player 1 dribbles off the pick, forcing player 4's defender to give help. Player 1 takes at least two dribbles past the pick to create space. Player 1 can then shoot a jump shot, pass to player 4 rolling to the basket, or pass to one of the other players (2, 3, or 5) set in a triangle formation on the weak side. Figure 11.21. Side pick-and-pop. Player 4 sets a pick at the wing for player 1. Player 1 dribbles off the pick, forcing player 4's defender to give help. Player 1 takes at least two dribbles past the pick to create space. Player 1 can then shoot a jump shot, pass to player 4 popping to the corner, pass to player 5 ducking into the lane, or pass to player 2 or 3 spaced out on the weak-side perimeter. Figure 11.22. Elbow pick-and-roll. Player 4 sets a pick at the elbow for player 1. Player 1 dribbles off the pick, forcing player 4's defender to give help. Player 1 takes at least two dribbles past the pick to create space. Player 1 can then shoot a jump shot, pass to player 4 rolling to the basket, pass to player 5 ducking into the lane, or pass to player 2 or 3 spaced out on the weak-side perimeter. Figure 11.23. 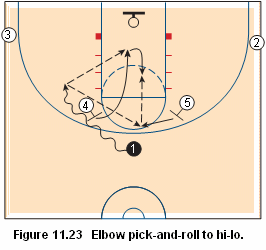 Elbow pick-and-roll to highlow. Players 4 and 5 set picks at each elbow. Player 1 dribbles off player 4's pick, forcing player 4's defender to give help. Player 1 takes at least two dribbles past the pick to create space for a pass to player 4 rolling to the basket or to player 5 popping high to the top. When the pass is made to player 5 at the top, player 5 looks first to pass to player 4 posting low in front of the basket; player 5 may also shoot a jump shot. Players 2 and 3 position themselves in each corner to spread the floor. You fail to create space when dribbling by the pick, thus allowing the help defender to defend you and the pass back to the picker. You must dribble at least two dribbles past the pick to create space for a pass back to the picker. Pick-and-roll plays may also be a part of an early offense at the end of a fast break. Various early-offense plays use the pick-and-roll in different spots on the court, including the top, side, corner, and elbow. 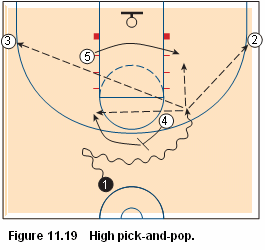 The following are some common early-offense pick-and-roll plays (figures 11.24 to 11.30). Figure 11.24. 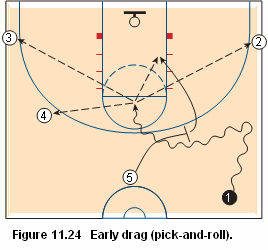 Early drag (pick-and-roll). Player 5 sets a pick at the top or side for player 1. Player 1 dribbles off the pick, forcing player 5's defender to give help. Player 1 takes at least two dribbles past the pick to create space. Player 1 can then shoot a jump shot, pass to player 5 rolling to the basket, or pass to player 2, 3, or 4 spaced on the perimeter. Figure 11.25. 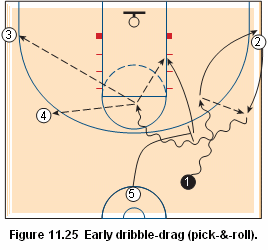 Early dribble drag (pick-and-roll). Player 1 makes a dribble handoff to player 2. Player 5 sets a pick at the top or side for player 2. Player 2 dribbles off the pick, forcing player 5's defender to give help. Player 2 takes at least two dribbles past the pick to create space. Player 2 can then shoot a jump shot, pass to player 5 rolling to the basket, or pass to player 3 or 4 spaced on the perimeter. 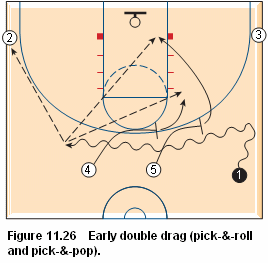 Early double drag (pick-and-roll and pick-and-pop). Figure 11.26. 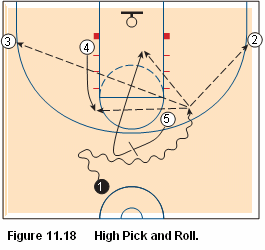 Early double drag (pick-and-roll and pick-and-pop). Players 5 and 4 set picks at the top or side for player 1. Player 1 dribbles off the picks, forcing player 5's and player 4's defenders to give help. Player 1 takes at least two dribbles past player 4's pick to create space. Player 1 can then shoot a jump shot, pass to player 5 rolling to the basket, pass to player 4 popping to the elbow, or pass to player 2 spaced in the corner. Figure 11.27. 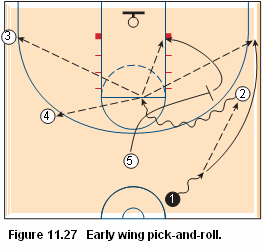 Early wing pick-and-roll. Player 1 passes to player 2 and cuts outside player 2 to the corner. Player 5 sets a pick at the wing for player 2. Player 2 dribbles off player 5's pick, forcing player 5's defender to give help. Player 2 takes at least two dribbles past the pick to create space. Player 2 can then shoot a jump shot, pass to player 5 rolling to the basket, or pass to player 1, 3, or 4 spaced on the perimeter. 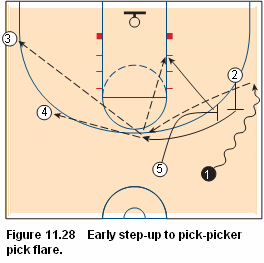 Early step-up to pick-picker pick flare. Figure 11.28. Early step-up to pick-picker pick flare. Player 2 sets a step-up pick above the wing for player 1. Player 1 dribbles off player 2's pick, forcing player 2's defender to give help. Player 5 sets a pick at the wing for player 2 (called pick the picker). Player 2 flares off player 5's pick, forcing player 5's defender to give help. Player 1 passes to player 2. Player 2 looks to shoot a jump shot, pass to player 5 rolling to the basket, or pass to player 1, 3, or 4 spaced on the perimeter. Early step-up pick to corner pick-and-roll. Figure 11.29. Early step-up pick to corner pick-and-roll. Player 2 sets a step-up pick above the wing for player 1. Player 1 dribbles off player 2's pick, forcing player 2's defender to give help. Player 1 continues to dribble to the corner. Player 5 sets a pick at the corner for player 1. Player 1 dribbles off player 5's pick, forcing player 5's defender to give help. Player 1 looks to shoot a jump shot, pass to player 5 rolling to the basket, pass to player 4 cutting to the weak-side post area, or pass to player 2 or 3 spaced on the perimeter. 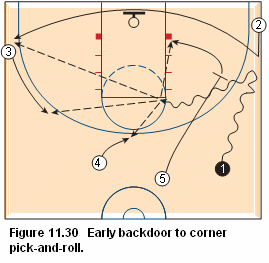 Early backdoor to corner pick-and-roll. Figure 11.30. 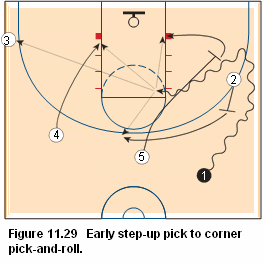 Early backdoor to corner pick-and-roll. Player 2 cuts backdoor. If player 2 gets open on the backdoor cut, player 1 will pass to player 2. If player 2 is not open, player 2 continues to cut to the weak-side corner, and player 1 continues to dribble to the strong-side corner. Player 5 sets a pick at the corner for player 1. Player 1 dribbles off player 5's pick, forcing player 5's defender to give help. Player 1 looks to shoot a jump shot, pass to player 5 rolling to the basket, or pass to player 2, 3, or 4 spaced on the perimeter. For more info and much, much more, get the book!